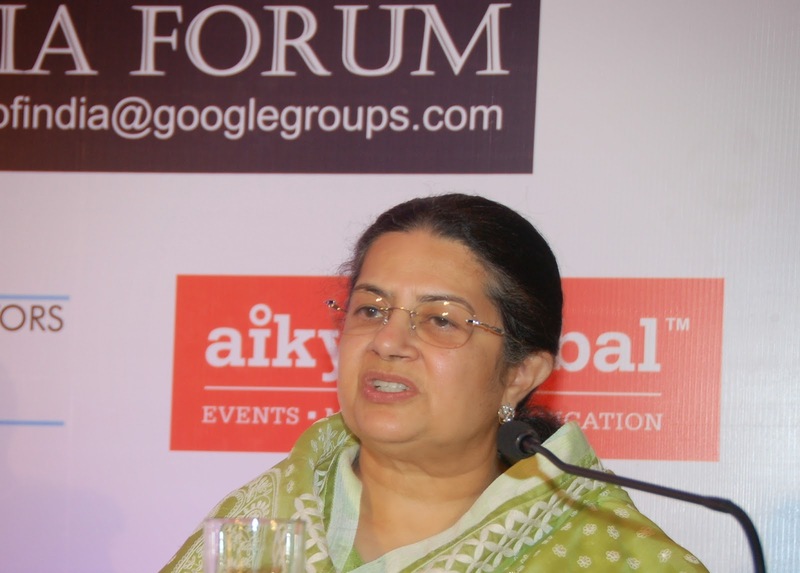 Think beyond Yourself, says Rajashree Birla - A PRapport Exclusive! I have had the privilege and honour of working with Mrs. Rajashree Birla since 1997. In my CSR portfolio, she is the dream boss. It has been, and continues to be, a great learning experience. There is something very touching about her tenacity. She leads with a single-minded focus — whatever it takes to lift the poor out of their poverty, she does in her own way. Compassion is the only currency that counts. It’s not just about our Group. Her gaze is fixated at the nation. Rajashreeji’s vision is to help raise the Human Development Index of India, which today stands at a lowly 136, even though we are on the intellectual map of the world. For her, it’s not about choices. For her, it’s a duty. She does not allow any baggage of the past to disturb her calm. Never a slighting word, no railing, no matter what the provocation — this is yet another ethereal quality of Rajashreeji. A karmayogini, she follows the philosophy of hope. An evolved, reflective, iconic leader, she is by nature endowed with a very sunny disposition and an optimistic, can-do attitude, always focused and forever willing to learn afresh. She is a great role model for women per se. The impact, in qualitative and quantitative terms, is awesome. Under Rajashreeji’s leadership, we have laboured hard to make her dream of freedom from poverty come true in some of our model villages in Rajasthan, Madhya Pradesh, Uttar Pradesh, Karnataka and Gujarat. You can see the changed face of the villages. From abject poverty to meeting the necessities of life. From dependency to freedom. From backwardness to progress — in more ways than one. In most of the villages where we are working, our committed teams have endeavoured to bring in change. There is a palpable difference. Tens of thousands of villagers now seem self-assured, confident and happy at being able to move towards a sustainable livelihood. There is new found dignity among them as they celebrate a new life. To ask Rajashreeji about our CSR projects, in one’s view, would be a tad superficial. All of you are aware of her stewardship. So one has opted to present different facets of her prismatic persona. Simple — live and let live. Today, I am about 90 per cent successful in living this philosophy day in and day out. I believe that this ‘live and let live’ principle embodies the philosophy of tolerance. It helps you recognise that every individual is distinct, different from you, and has the right to his or her own views and attitude. I am also a great believer in self-acceptance. Accepting yourself unconditionally, believing in yourself, is very important. Many times people tick themselves off because they have not measured up to their image of themselves. If it is not for want of effort, you should just let it pass by. I think one has to learn to be kind and gentle to oneself. You must accept yourself as you are. And my mind is like a blank slate. No baggage of yesterday. “Think beyond yourself”. Have heard you say so often. Elaborate. Think beyond yourself. Recall Satya Nadella’s email to employees when he stepped in as CEO at Microsoft. He wrote, “I truly believe that each of us must find meaning in our work. The best work happens when you know that it’s not just work, but something that will improve other people’s lives.” Reach out to all those, who are not as blessed or privileged as we all are. Work to make a difference to them also. Leave behind a legacy, that of a good, honest human being who cared for others. “This too shall pass” — just four words which tell you that everything in life is ephemeral. Nothing lasts forever. In any situation, it holds true, and gives enormous strength, resilience and hope. So it helps you go through the rough times without despairing and good times without being too overwhelmed. When Kumar Mangalam cleared his CA in the first attempt and was among the toppers, I was over the moon. At that point in time, there were no coaching classes for students who aspired to do their CA. I know of many youngsters who cleared the CA in the third attempt. Today, there are coaching classes and earning the CA qualification is tough, but not that tough. I know of many Marwari girls who have now earned a CA degree. You know he did his B.Com and CA together. From Sydenham College he moved to HR College, which had morning classes. It was a tough slog for him, juggling two academic programs side-by-side. Of course, hard work, perseverance, rigour, meticulous attention to detail, a degree of seriousness and integrity were his hallmarks then and are his defining characteristics even today. But I think all mothers get tense and worried when children take exams. Having said that, Adityaji was absolutely confident and was sure that for Kumar Mangalam it would be no problem. What about his MBA from London? In contrast, when Kumar Mangalam enrolled for his MBA at the London Business School, I was not at all worried. Adityaji and I were more than certain that he would make the grade. Neerja went along with him to London and that kind of gave us great comfort and a sense of reassurance. She helped him enormously every which way. And they quickly settled into a groove. Still at 24, Kumar Mangalam was by far the youngest in the class. He did brilliantly. His entire educational trajectory was charted out by Adityaji and Kumar Mangalam never questioned it. He had blind faith in his father and idolised him. For parents of our generation, being protective of the girl child was the norm. Even for Vasavadatta, Adityaji decided what course she would pursue. So, after graduation, he felt she should go to Switzerland’s finest finishing school. Vasavadatta was also happy to do so. She has done the Montessori course at Sophia College (Mumbai University). She feels that this course, which is primarily a teacher’s program, has helped her raise her kids — my grandchildren Anandmayi, Yugadikrit and Vishwarupe. Kushagra (Bajaj), my son-in-law, backs her to the hilt. (Laughs) Changing, albeit at a slow pace. But if you are educated, you have the intelligence, the wit and the verve, you can pull it off. In life, I believe you have to find your own trail, you shouldn’t let your (woman’s) identity be subsumed into the man’s, whatever your relationship. Today the world is nowhere near to the world that we knew as young parents. Distances don’t matter. Children leave the comfort of their homes in their teens itself to study abroad. Technology is such a marvel, you can talk whenever you want and you can Skype whenever you want to see them. It’s so different. Adityaji could choose courses for Kumar Mangalam and Vasavadatta. Today’s children are encouraged to pursue their passion and fulfil their dreams. My grand-daughter, Ananyashree, took a sabbatical to found Svatantra Microfinance Limited, an NBFC. Currently, she is studying at the Oxford University. Kumar Mangalam could have never dreamt of taking a sabbatical. But Neerja and he went with her dreams. Adityaji and I would have been startled if our children would have wanted a break after their board exams. All straightjacket thinking, but now the times are changing. No single role model as such. I find life is a journey where you meet so many interesting people. Many of them have uniqueness, a trait which I begin to admire, and that influences me as I move on. Having said that, the three people who cast a spell on me are: Ma (Dr. Sarala Birla), my husband Adityaji, and now for nearly two decades, Kumar Mangalam (my son). 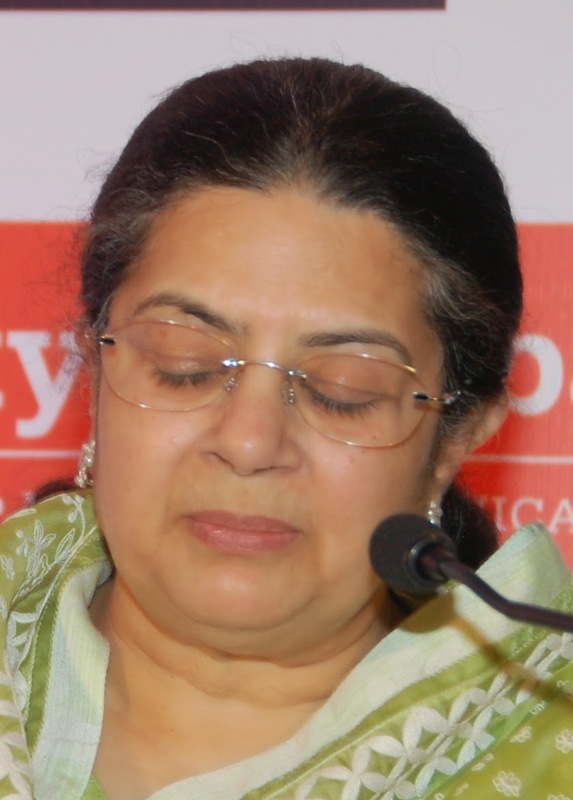 Ma (Dr. Sarala Birla): She has an indomitable spirit. She symbolises commitment, passion, integrity and compassion. Apart from being one of the finest educationists, having established more than 20 schools, she is a woman of substance, a highly spiritual person. Even today at 86, she is extremely sprightly and very active. Not a single lazy bone in her. She is a great source of inspiration for me and many, many others. My husband Adityaji was my greatest guru. I was engaged at 10 and married at 17, that was kind of expected. So, I would go to Birla Park in Calcutta and have a wonderful time with his two sisters — Jayashreebai and Manjushreebai. It was much, much later, and only during the last few months, when Adityaji was at MIT, that we started writing letters to one another, after being permitted to do so by our respective parents. He was 21 and I was 17 when we got married. The early years he was very busy putting up factories in India and outside. He was an absolutely doting father to Kumar Mangalam and Vasavadatta. A true karmayogi, there was a uniqueness to Adityaji. Beyond dynamism. Beyond vision. So much of compassion. He had a lot of positive energy, the passion and the edge to do something for the underprivileged, besides his companies’ stakeholders. It wasn’t cheque book philanthropy. I deeply admired these traits. And that then had a resonance in my own life, moulding it in so many ways. On all counts, the Gita is the stairway to a higher purpose in life. It teaches how to transcend oneself through contemplation, self-control and meditation, and compassion as well. All of which help quieten the chatter of the mind, which ceaselessly flits from one issue to the other. The Gita teaches you how to master the mind through following the path that it enshrines. It transposes you to an entirely higher plane, giving you inner peace and a kind of tranquillity. Today, more than ever, most people, all over the world, are seekers of this inner peace. People have begun to realise the need for self-control in the midst of unrelenting stress. We as a family look upon the Gita as our spiritual guide. Our aspiration is to try and reach the exalted level of the true karmayogi. (That’s the secret of Rajashreeji’s calm, unhurried, unflappable self, always brimming with patience.) In fact, Adityaji and I grew up in the spirit of the Gita. Both of us listened to the discourses on the Bhagvad Gita. It gives you an inner strength, a sense of equanimity and fortitude. It helped me cope with the passing away of Adityaji. He was the noblest of the noble. But we did not ask God, why him? We accepted God’s will unconditionally. I read the Gita regularly. And this has percolated. Kumar Mangalam and Neerja hold a satsang every week at home with a group of their friends. During the two-hour satsang, the focus is on spirituality and the teachings of the Gita. As a parent, I see a lot of compassion, goodness and nobility of character in Kumar Mangalam and Neerja. And I see these values percolating to my grandchildren — Ananyashree, Aryaman and Advaitesha. I admire the way they are growing up. If, as parents, we follow the straight and narrow path, if we keep doing the right thing, children are bound to imbibe those values from you. Of course, ultimately we do what we can do — give the best of values and the best of education. If these two are in place, everything else will fall in line. As a family, we subscribe to the trusteeship concept — the wealth that is generated is to be held for larger purposes. Quite honestly, how much money one needs is a difficult question. People would tend to say whatever is the comfort level for them. Money is important up to a point. Thinking beyond yourself and helping others and making this a part of your life makes me feel good. I think it is a good thing to do. After Adityaji’s demise, Kumar Mangalam suggested that I look after a few units. Very quickly I realised that I was not cut out for business and I told him so. Then, a year down the line (1997), we set up the Aditya Birla Centre for Community Initiatives and Rural Development. Our CSR projects became structured and very meaningful. I find that our work in communities and my involvement has endowed my life with a sense of purpose. The book on your bedside table? I believe that if you view life through the lens of a positive prism, you will only be greeted with positivity. I have found that reading books like Don’t sweat the small stuff..... and it’s all small stuff by Richard Carlson, Joy 24x7 by the spiritual master Sadhguru, Seven Habits of Highly Effective People by Stephen Covey, also help enormously in stoking positive thoughts, which enable us to go with the flow. So these kinds of books occupy my shelves. Every year, we head off to some exotic destination and explore new countries. We are a bunch of buddies who travel together and press the limits in exploring new geographies and exotic places. So we have been to Australia, Croatia, New Zealand, Canada, the Rockies, South America, South Africa, China, Egypt and Turkey. We will head off to Japan soon. It’s a lot of fun and every place just amazes me, and I see myself soaking in their culture and their history. In a manner of speaking, these are wonderful learning expeditions too, and great leisure pursuits. You dream of An India free from poverty. In the villages, and elsewhere, when you see men and women ravaged by poverty, it hurts. We have seen all this. With the right focus on inclusive growth in the foreseeable future, this is not a pipe dream. And of course a world with more of peace and minimal conflict. Utopia? Is it? (Reproduced with the permission of Dr. Pragnya Ram, Editor, ‘Aditya’, the management journal of the Aditya Birla Group). Level-playing field for Girls, please!